In the 1980s, many newspaper comics tried to emulate the raging success of Charles Schulz’s Peanuts. They began imitating its deceptively simple style and its focus on children and funny animals, like Snoopy, that were easily marketable. Unfortunately, these comics missed the true reason that Schulz’s comic was so successful: their philosophical and down to earth themes ("Comic Strip: Calvin and Hobbes"). Thus, the face of the medium changed to one of gag-a-day strips meant only for laughs with no real content. One writer, however, hit Schulz’s style on the dot and added his own touch to it: Bill Watterson. His comic, Calvin and Hobbes, not only expresses a uniquely genuine portrayal of childhood, but also uses satire to express Watterson’s views on how society has corrupted or negatively impacted daily life. One of Watterson’s main critiques of work and school is the way that society has broken time into obligational, omnipresent duties and “holiday” or “vacation” time. In this comic strip, Watterson uses Calvin as a satire of the everyday human being. We realize how odd this delegation is, and the fact that life should be an adventure, and yet we use all of our free time on pointless “mental anesthetics” (Pg 6, Banks) like television, and, more recently, the internet. The fact that Calvin is a child and not an adult furthers Watterson’s argument; it shows the reader that this problem is so blatant that even a kid with little experience in the world notices it and recognizes instantaneously that the system is faulty: it doesn’t take a genius, so why hasn’t someone fixed it? Calvin’s age also shows how far reaching this delegation of time is. “What kind of world is this?! You only get five years to be a kid? ?” he shouts, outraged. Even being a so-called “kid” and having fun is severely limited. After you get into first grade, you are swamped with homework and responsibilities, though you have your whole life ahead of you. Calvin is constantly thinking like adult, aka about the “big picture”. When it’s not about death, it’s about the future, about God: about the point of living. In this strip, the irony of Calvin asking a serious question about life in a place of learning and being utterly and immediately dismissed supports Watterson’s argument that the way society has corrupted learning through school. Though, as every high school guidance counselor will tell you, school is about preparing you for the “real world,” it is hard to find many direct ways in which schooling really answers our questions about life. By questioning the system’s usefulness, Calvin becomes a rebel. No one likes Big Picture people, aka if you don’t conform to society, no one will like you. But if we do not question the system, how can we learn? Education has become homogenized due to this forced schooling society has implemented. In this strip, Calvin uses a snowflake as an analogy for the school system. Each child is utterly unique and amazing, yet they are all treated the same. In Calvin’s words, they become “ordinary [and] boring” once you bring them into the classroom. Watterson’s diction here is crucial: he does not say that being inside, aka living in a house in a so-called civilized manner, is what homogenizes humans; we do not have to live like cavemen to be ourselves. However, if we continue being so close minded when it comes to teaching, the things that make each child amazing will be lost and society will continue to be a corrupting, conformist force. After all, children are the future: society cannot change if they are raised to be picture perfect copies of their parents and each other. 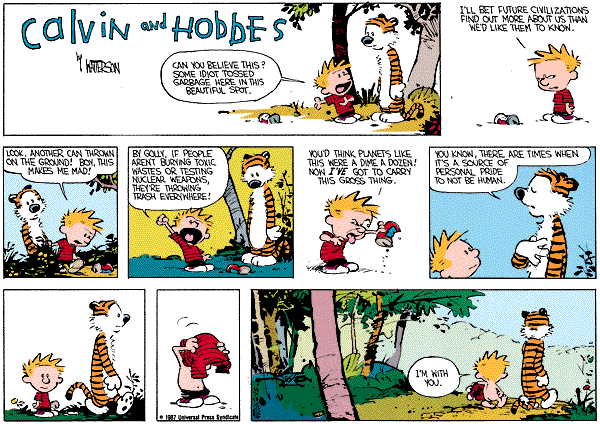 Watterson also uses Calvin and Hobbes to show society’s effect on the environment. In this strip, Calvin’s age is once again used to point out how obvious the problem at hand is. Pollution is everywhere, from back yards to shopping centers and yet many people claim it isn’t a problem. Calvin sees how idiotic this view of the world is; we only have one planet and yet, we don’t take care of it. Hobbes is a satire of philosopher Thomas Hobbes who had what Watterson called “a dim view of human nature”. In this strip, the tiger expresses Hobbes’ philosophy that humans' natural state is one of war: “solitary, poore, nasty, brutish, and short" ("Hobbes") through the statement that it’s a source of personal pride that he isn't human. By stating “I’m with you,” Calvin agrees with him and ironically denies his own humanity. This goes to show that society has twisted the meaning of being human into something so shameful that even a child would rather be something else. Some may dismiss the impact that the satire in Calvin and Hobbes has had on its readers. This attitude generally comes from the “gag-a-day” format that has become the face of comics today, as mentioned in the introduction. The fact that Watterson’s strips were featured daily in the newspaper “funnies” certainly adds to the bias. However, one cannot mistake the message for the messenger in this case. Comics are simply a medium, “a vessel which can hold any number of ideas and images” (McCloud, 6). Though Watterson’s work may seem like a simple, just-for-laughs piece at first, the medium is actually a very important part of the message. The simple style of Calvin and Hobbes helps it be relatable to the viewer. Humans see ourselves in everything; a circle, two dots, and a line become a face not because they actually resemble one another, but because the human mind’s sustained concept of its own features is just a sketchy sense of general placement. A cartoon face is more relatable to the viewer because it reminds us more of ourselves; it is a blank slate on which we can project our own image (McCloud, 33-37). This is why the reader is able to relate so readily to Calvin. As for the jokes, they draw in the audience. The entire point of satire is to be humorous while simultaneously conveying a message. Calvin and Hobbes is a name known and beloved by millions of people around the globe. It is simultaneously funny, insightful and relatable to both children, who may not fully realize the meaning of each strip but love them all the same, and adults, who may look nostalgically upon their childhoods and realize that the comic is a guide to life and jab at society. While no work of literature or art is perfect when it comes to communicating its message, to say that satire is ineffective is simply ignorant. Calvin and Hobbes is a prime example of just how well it works; come for the laughs, stay for the insight.